The Harkin Institute’s bipartisan National Advisory Council is comprised of national leaders in business, public service and education who provide guidance and direction for the institute while serving as some of its most ardent supporters. In addition to providing valuable insight on strategic planning for the institute, members of the National Advisory Council (NAC) play a vital role as speakers and mentors. 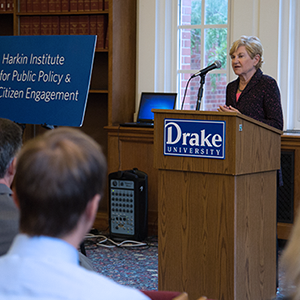 Through various capacities, NAC members offer internship and professional development opportunities to Drake University students involved with The Harkin Institute.